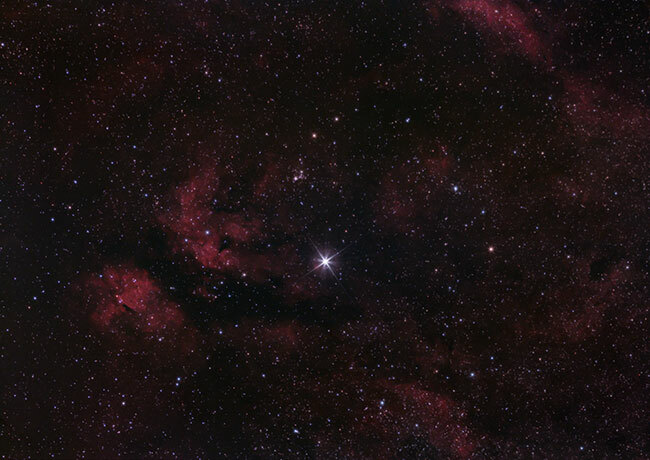 The Sadr Region in the Cygnus refers to the hydrogen emission nebula surrounding Sadr (Gamma Cygni) in the cross of Cygnus. In this area of the night sky you will also find even more deep sky astrophotography targets such as the Butterfly Nebula (IC 1318), and the Crescent Nebula. 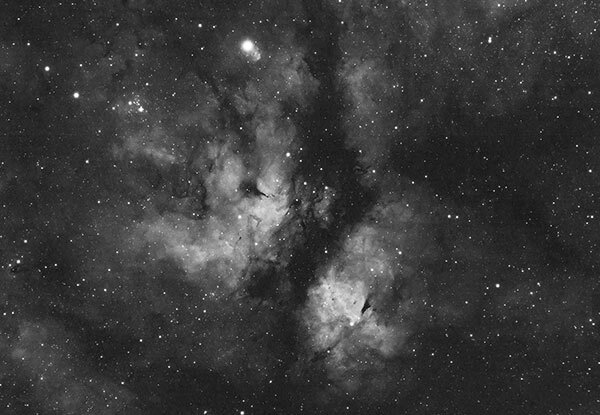 The photo below centers the image frame around Sadr, and showcases the diffuse emission nebula in this area. This photo was captured using a Canon EOS Rebel Xsi and a Canon EF 300mm F/4L lens. 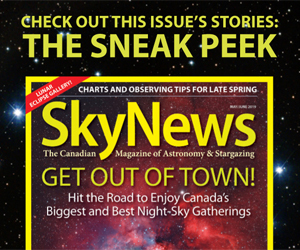 The camera was mounted to an iOptron SkyGuider Pro mount to track the night sky. The star, Sadr, surrounded by a hydrogen emission nebula. At this focal length, the Butterfly Nebula and NGC 6916 are visible. An even wider image will reveal the many interesting deep sky objects in the Sadr region. I would like to photograph the Sadr region again in the future, with the 250mm focal length of the RedCat 51. 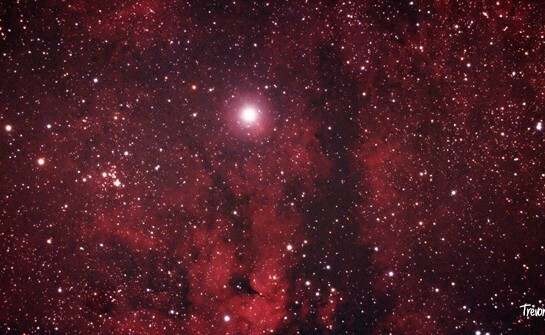 There is some very interesting nebulosity surrounding the star, Gamma Cygni. Sadr, the stars traditional name, has 12 times the mass of our Sun and about 150 times our Sun’s radius! What a monster! What a supergiant! 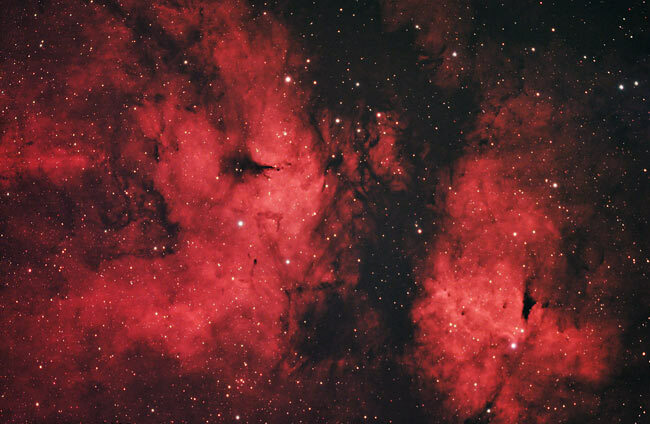 IC 1318 is considered to be the diffuse emission nebula surrounding Sadr, or Gamma Cygni. I think that this image turned out okay. I had some issues with framing, and I may have chewed up the stars a little too much in processing. I will often trade more detail in the nebulae for smaller, crunchier stars. I just try to view the image as a whole, and not judge it to critically while zoomed in. I feel that with better equipment, I may be able to achieve better results. In 2018, I again revisited the Sadr region, this time focusing on the bright emission nebula, IC1318. The photo below was captured using a Canon EOS Rebel T3i DSLR camera through the William Optics Zenithstar 73 APO. When I think of astrophotography in the summer, I think of the all of the gorgeous nebulae and stars in Sagittarius and Scorpius. The Southern treats that only stay up long enough to image for 3 short months. Being late August, those days are already gone. I won’t visit the Lagoon Nebula, Trifid and Eagle Nebula again until next spring. Late August also shows us a preview of what the Fall and Winter constellations await us in the early morning hours. I watched the mighty Orion rise from my driveway at 4:00am. The shifting of the constellations in our night sky is a beautiful way to witness the seasons change. My current astrophotography camera (Canon Xsi/450D) has been through countless outdoor all-nighters. I fear that the shutter actuation count is very high, (I’ll check eventually) and that a “shutter-explosion” is imminent. Not to mention the constant manual cleaning of the sensor, and the fact that I took the entire thing apart to modify it! I plan to look into an entry level CMOS astronomy camera soon and to transition away from my aging Canon. Just below Sadr, lies IC 1318, the Butterfly Nebula. Although it may look like two nebulae, it is actually cataloged as one, with a central dark dust lane running through it. The nebulae on each side are the butterfly’s wings. The following image was captured using a William Optics FLT 132 refractor, and a ZWO ASI294MC-Pro CMOS camera. An STC Astro Duo-Narrowband filter (Ha + OIII) was used to isolate the intense hydrogen and oxygen gas that this nebula is comprised of. This photo includes just over 6 hours worth of total integrated exposure time from my backyard in the city.